Each year, tourists, scholars and pilgrims flock to Rome to admire and study,or simply be awed by, the architecture, art and history of The Eternal City. Looking out across the modern city, looking at St. Peter's, the Castel St. Angelo, Palazzo Farnese, the countless churches and villas, all spread against a backdrop of ancient splendour, such as the Colosseum, the Circus Maximus and the arched aqueducts of the ancient imperial capital, it is easy to believe that Rome is, indeed, "eternal". Yet, the Eternal City has had some very ephemeral moments. It is ironic that the fortunes of the city of Rome took a turn for the better only after so much misfortune had befallen the institution so closely connected with that city, the Roman Catholic faith. The year 1300 is often said to have been the zenith of the Papacy, marked by a gigantic celebration in Rome presided over by Pope Boniface VIII. In retrospect, however, it was really one huge farewell to the good old days, times that would not come again for the Popes. The Western Christian Church (Rome) had come into its own, on the worldly plane, in 756, when Charlemagne's father, Pepin III, rendered unto Christ a lot of what had once belonged to Caesar—land. That gift, consisting of a large part of central Italy, was the beginning of the Papal State, a church-state ruled by the Pope King. Over the next few centuries, a papal vision took form, a vision of Europe as a single theocracy with its earthly princes subject to the princes of the Church, or, in the words attributed to Pope Gregory VII, pope from 1073 to 1085: "The Holy See has absolute power over all spiritual things: why should it not also rule temporal affairs? God reigns in the heavens; His vicar should reign over all the earth." That, of course, was not to be. The 1300s saw the birth of Humanism in European philosophy. It was a movement away from the rigid medieval mold according to which everything and everyone had a fixed place within the Church, the Empire and the feudal hierarchy. Pico della Mirandola (1463-1494) put these words in the mouth of God in his Oration on the Dignity of Man: "…I have made you neither heavenly nor earthly, neither mortal nor immortal so that, like a free and sovereign artificer, you might mold and fashion yourself into that form you yourself shall have chosen." Nothing could be more contrary to the spirit of the papal vision. And nothing could be less medieval. Besides such changes in thinking, which marked the true end of "The Middle Ages" and the beginning of the Renaissance, there were much more tangible events that would underscore the fact that the earthly princes were no longer willing to have "…His vicar reign over all the earth." The most dramatic of these involved a struggle between the Church and France's King Philip the Fair over the right of laymen to tax the clergy. It was a dispute that led to the imprisonment and death of the Pope in Rome in 1305 at the hands of agents of the King. The new Pope, a French prelate, agreed to move the Papacy to Avignon in France in 1309. This lasted until 1377, a period referred to in Christian history as the Babylonian Exile of the Papacy. It was a period that would decide the centuries-old contest between the Church and the kings of Europe for temporal supremacy once and for all in favor of kings. The more than half-century of Papal absence from Rome was a rough period for the city. Throughout the 1300s, the city was riven by factional strife. Also, the Black Plague beset the population, and by 1400 Rome was described as a city filled with thieves, huts and vermin—a place where around St. Peter's, itself, wolves could be seen at night. In comparison to the great medieval states to the north, such as Florence, for example, or the maritime republic of Venice, the city that had once ruled the known world was a village. extended building project "St. Peter's." When the papacy returned to Rome, in one sense it returned to a less " believing" city than a century earlier. The years had been marked, certainly, by confusion —the confusion of the Avignon popes and the succeeding Western Schism of popes, anti-popes and even anti-anti popes— but also by an enormous revival of interest in the glories of ancient Rome, indeed, even by a short-lived attempt to set up a Roman Republic. And right along with all the tribulations of the time, it was also a period when the Italian poet Petrach started referring to the centuries between the fall of Rome and his own time as the "Dark Ages," almost heretically ignoring the "light" that Christianity had shed on those centuries. A feeling was taking hold that only by a rebirth of ancient learning could Europe be brought out of darkness into a new light. "Rebirth" is the key word. Renaissance. Rome was on the verge of change. The Popes began a conscious campaign to make Rome the center of a normal Renaissance state, a spiritual center, yes, but also a temporal power that might one day unite the peninsula again. They began a wave of construction, building streets, bridges, hospitals, fountains, and churches, drawing on the genius of Renaissance art and architecture to transform the city into tangible proof of the power and glory of the church. The wave can be said to have started in the 1450s with the Vatican fortifications and then the beginning of the rebuilding of St. Peter's under Pope Nicholas V (pope from 1447-1455). Under a succession of Popes, building was often irrational, but spectacular. Like magnificent mushrooms, churches and villas sprang up helter-skelter at the whim of Papal egocentric spontaneity and their desire to stamp their own mark on the city. The gloriously sprawling city that is modern day Rome, with no true center of the city, is a direct result of this urbanism begun in the Renaissance. The papal curia —the central administration of the church— became one of the most efficient governments in Europe. 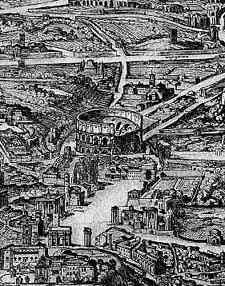 Through its efforts, Rome, between 1450 and 1600, took shape. Besides directing new construction, they set about to rediscover the original ancient city by identifying major sites and buildings, and began the task of copying the ancient inscriptions that made the city a true textbook on the Roman empire of old. By the middle of the 16th century scholars knew Rome better than anyone had in a thousand years. The combination of spiritual and intellectual energies that propelled such construction and investigation made Renaissance Rome somewhat of a paradox. On the one hand, as the center of a major faith, it promoted that faith. On the other hand, it was part of the great intellectual movement of the Italian Renaissance, Humanism, a movement bursting with earthy energies to rediscover the important biological works of Aristotle and Hippocrates, to translate the mathematics of Archimedes and the Geography of Ptolemy (which would inspire Columbus); to study the great Latin encyclopaedia of Pliny; to promote scholarship in Hebrew, Greek, Arabic and Coptic; to let Palestrina invent the music of the future by revising ancient Gregorian chants, and to be patron of geniuses such as Michelangelo and Raphael. Behind it all was the desire to restore the city of the apostle Peter to its rightful glory. What Nicholas V said on his deathbed about building in the new Rome of his day might well be said of the entire physical and spiritual rebirth of the Eternal City in the Renaissance: "Not for ambition, nor pomp, nor vainglory, nor fame, nor the eternal perpetuation of my name, but for the greater dignity of the Apostolic See… did we conceive such buildings in mind and spirit."